Senyati Safari Camp is situated in the Lesoma Valley, Northern Botswana, 20km from Kasane. Senyati Safaricamp can accommodate both campers and those who prefer some ‘home’ comfort. The camp is comprised of 8 fully equipped, self-catering chalets and 20 campsites with each its own ablution facility. 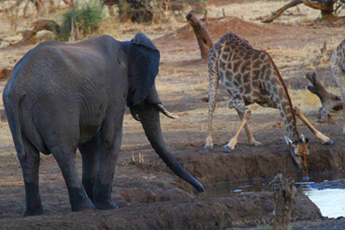 Although Senyati Safari Camp is very private, the waterhole knows no privacy. A variety of animals come and go throughout the day. The waterhole is frequented by a good variety of species such as hyena, banded mongoose, warthogs, roan antelope, monkey baboons, buffalo, sable, elephants and the occasional leopard. An early morning cup of coffee can be enjoyed on the deck while the vultures enjoy their early morning drink. 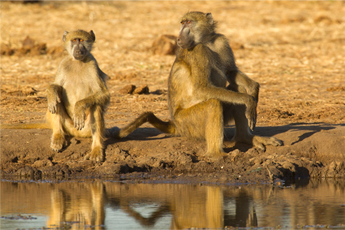 Baboons come from every direction, drinking, eating and even “walking on the trees”. On a regular basis, mid-mornings is the time to see the roan antelope visit; with the occasional early morning visit from a leopard. One fish eagle, in particular, has made Senyati’s waterhole his home. As evening falls and darkness comes the waterhole is lit by yellow flood lights. While enjoying a sundowner guests are able to enjoy watching family after family of elephants arriving for their evening drink, some even taking a swim. Once their thirst is satisfied they nobly wonder off into the bush only to repeat their evening ritual the next day. Senyati belongs to the elephants. During a good day more than 400 elephants will come and go. To the right of the waterhole there is an “Olympic size” elephant swimming pool. This is basically a “donga” pool of mud where the elephants bathe and socialise. During summer months buffalo herds easily exceed 300 in number and it is not uncommon to see buffalo and elephants competing for position at the waterhole. Should the king of the wild make an appearance, lion of course, the buffalo make a hasty retreat. It is a possibility that visitors have the ultimate experience of watching the king of the wild quench his thirst at the waterhole along with the regulars — the elephants. December and January are the two months favoured by birdwatchers for visiting Senyati Safari Camp. During these two months there is an abundance of various bird species. Watchers are able to enjoy their favourite hobby sitting on the deck watching, twitching and ticking off their list of ‘must sees’ as the day progresses. When guests refer to our cash bar as ‘the Bar with the best view in the world’ they are not exaggerating – it is the absolute truth! Drifting off to sleep at Senyati we guarantee you a lullaby of hyena and jackal calling.